The website for the Center for Coastal & Ocean Mapping – Joint Hydrologic Center (CCOM-JHC), a University of New Hampshire and NOAA research center, is a treasure trove of information and images of modern seafloor mapping technology. 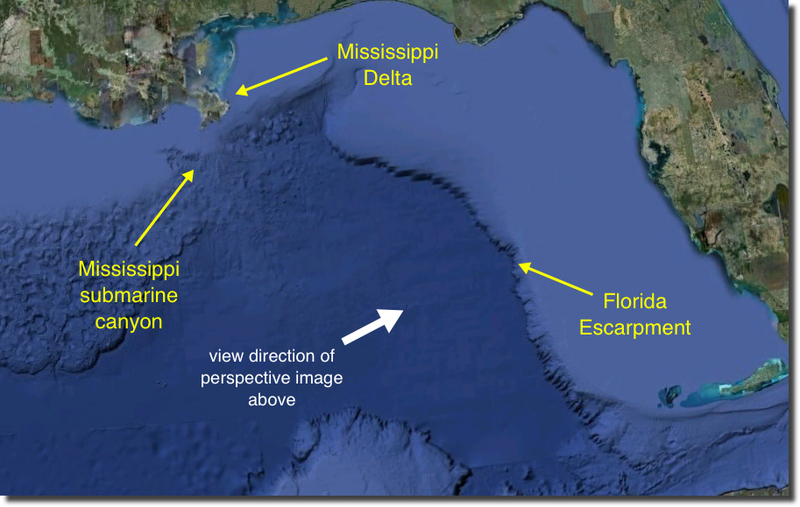 I came across this fantastic perspective image of the Florida Escarpment and deep basin floor of the Gulf of Mexico (see the regional map at the bottom of the post for context). 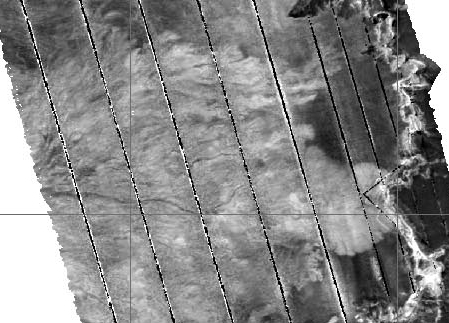 What you’re looking at is a backscatter image, which relates to the intensity of the returned signal (read more about seafloor mapping technologies here). If you look at the flat basin floor you’ll notice a dashed yellow line drawn in — this separates the the light-colored, or high backscatter, regions from the dark-colored, or low backscatter, regions. The lighter colored regions are interpreted to represent sandier sediment and the dark is muddier. The finger-like, lobate shape of the boundary of those sandier sediments are submarine fan lobes that are constructing the Mississippi submarine fan over time. The next image below shows the same area but now in a regular map view. The backscatter image on the submarine lobes reveals a complex texture of small channels traversing the seafloor. I’ve zoomed in a bit more in the image below. This rich geomorphology is created by many thousands of years of turbidity currents delivering sand and mud from the Mississippi delta front to the deep sea. This map below shows the regional context for the images above. Thanks for featuring a US Law of the Sea data set. We hope that more people will take more advantage of these public data sets! Sure thing … I love that these data are out there for people to see!